Video courtesy of Banana Slug News. 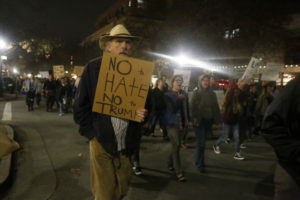 Outraged by the outcome of the presidential election, protesters organized for the fourth time in one week at UC Santa Cruz to march more than eight miles in protest against Trump’s presidency. 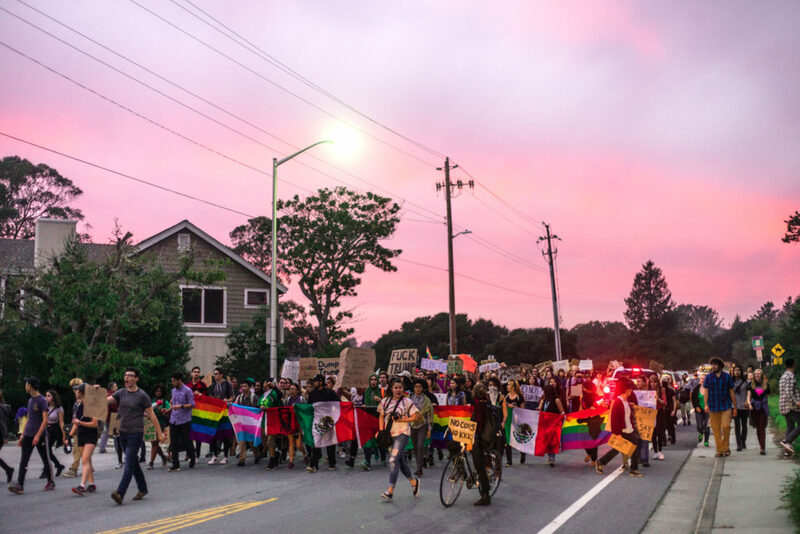 Friday’s demonstration, facilitated by UCSC students Dominique Mayden and Omar Paz Jr., was a product of deliberation on how to turn the impassioned masses into an action-based coalition. With 1,000-strong at its peak, Friday’s demonstration was the first step. 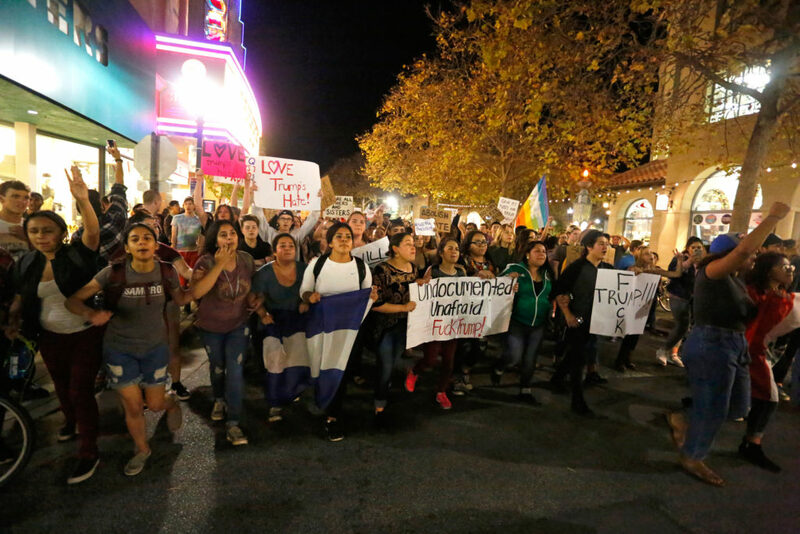 Mayden and Paz addressed the growing crowd to review the agenda they had planned for the demonstration including the main rally at Mission Plaza followed by a march through downtown Santa Cruz. They emphasized being peaceful and the role of white, privileged individuals who should help amplify the voices of individuals from marginalized communities. 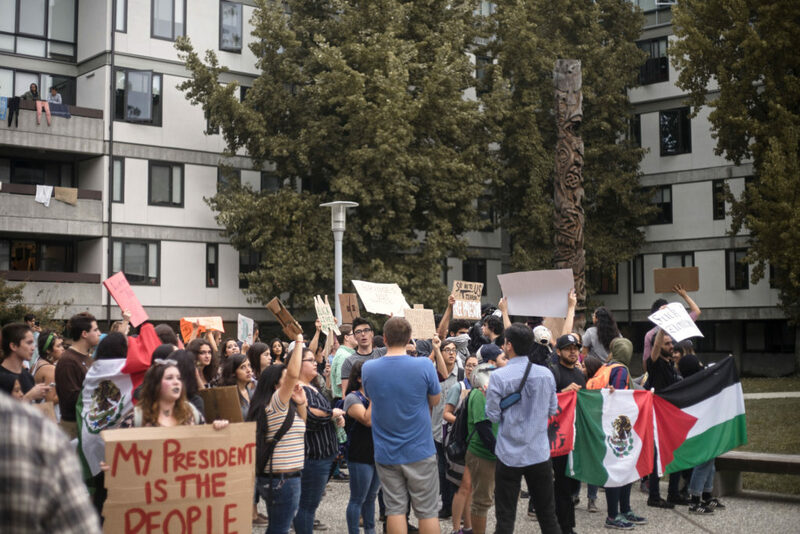 With dozens of signs painted and flags from places such as Mexico and Palestine tied together in solidarity, the march began through campus to gather more students. The group of 100 protesters grew to about 300, as it wrapped around campus from Stevenson to Oakes College. As the marchers left campus, led by seven cyclists clad in all black and most masked, they shut down Empire Grade. Cars pulled off the road, many drivers honking and clapping in solidarity. The sun set, wrapping hundreds of protesters in vibrant pink hues, as they marched into the night towards Mission Plaza where hundreds more awaited them. 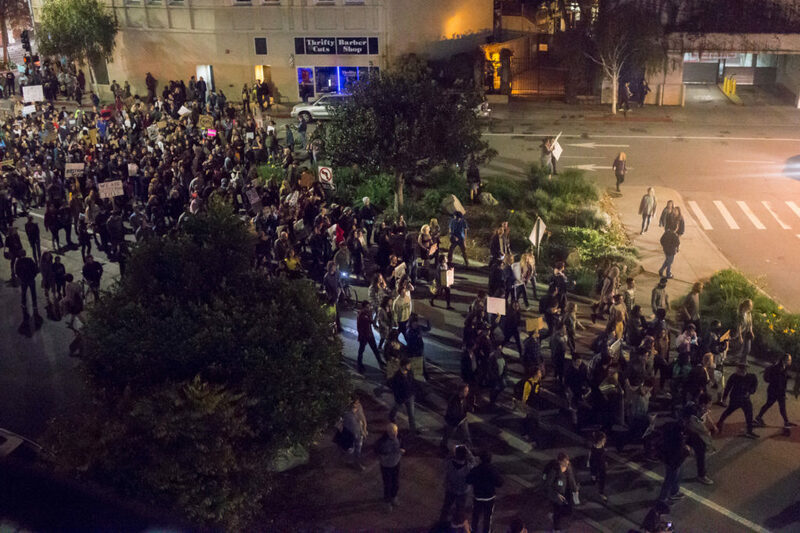 Clusters of new protesters joined the march en route to Mission Plaza. The 600-strong group, ranging from teachers’ unions to anarchist groups, Bernie Sanders supporters to Hillary Clinton supporters, now waited in the dark. From a glitchy microphone, Dominique Mayden led a moment of silence followed by an open forum where individuals lined up to voice their feelings and potential plans of action. “Coalitions will become stronger in times of crisis but this is only true if we share a commitment to working within our difference. Many of us are here because we want to experience a form of political catharsis. We want to release all of our frustration of the current state of things, and we want our voices to be heard. Our voices become amplified when we speak from a place of unity,” said a representative from Students for Justice in Palestine who prefers to remain anonymous. Dozens of individual stories, thoughts and ideas were expressed — from anguish and heartbreak to deliberate action. And with a single anonymous cry from the crowd, “let’s take it to the streets,” the protesters lifted their signs and flags and marched. “Whose streets? 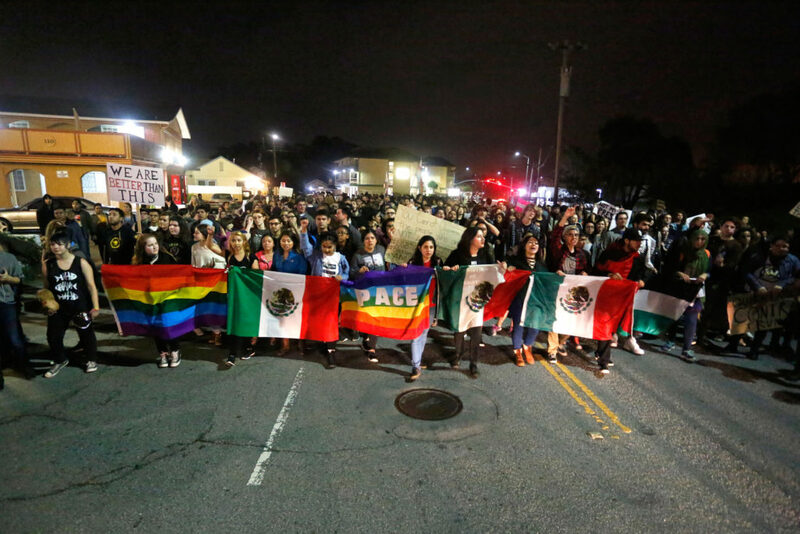 Our streets,” they yelled as the group turned off of Pacific Avenue on to Front Street, doubling back through downtown — now 1,000-strong. 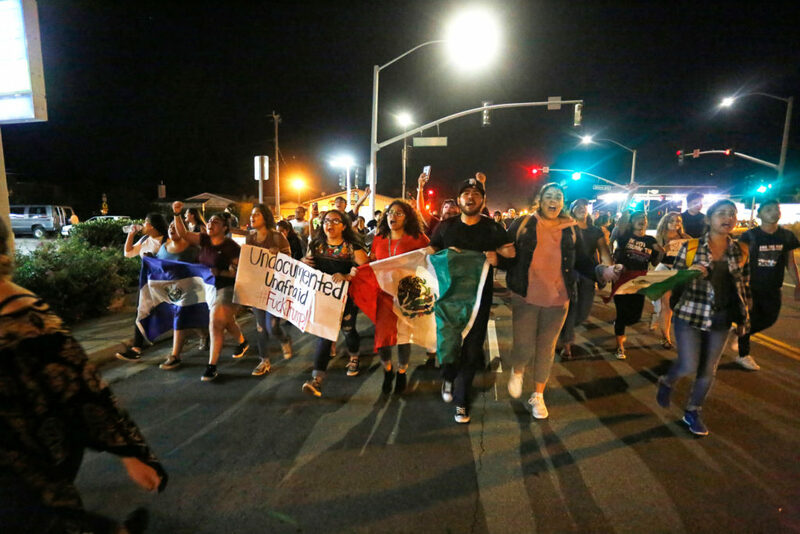 They stopped to discuss if they wanted to block Highway 1, which was not originally part of the plan but gained traction, as the march grew in size and volume. People walking their dogs and a woman dressed in polka-dot pajama bottoms joined the protesters with raised fists. “Say it loud, say it clear. Immigrants are welcome here,” echoed through the Beach Flats streets more than any other chant. The group’s dedication to nonviolence was tested, including a moment when a few masked individuals doused an American flag with rubbing alcohol and lit it on fire. 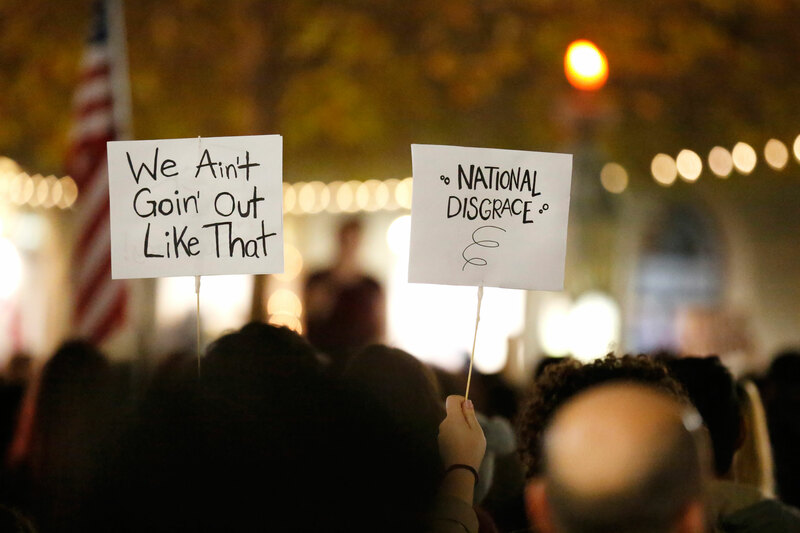 The individuals saw this as a form of protesting white supremacy while others saw it as divisive. The fire was extinguished and the majority of the demonstration fizzled to an end in front of the Boardwalk.